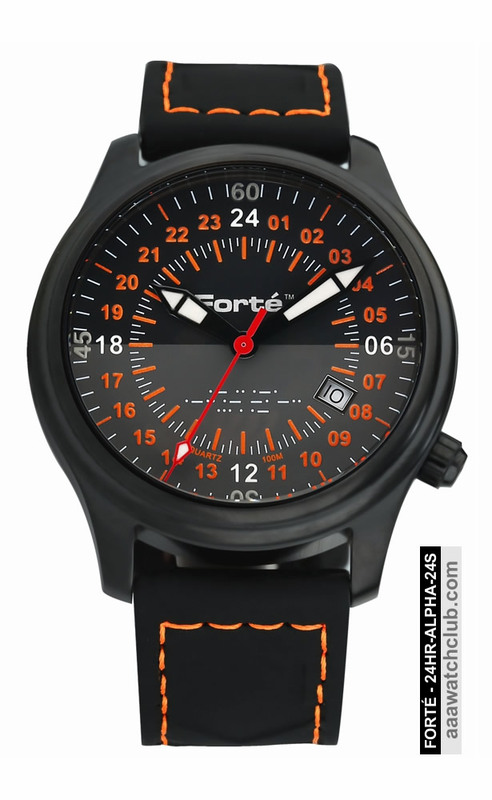 Real 24-hour Swiss-Movement: ALPHA Series Military Time Watch. Forté - Exclusive Label. 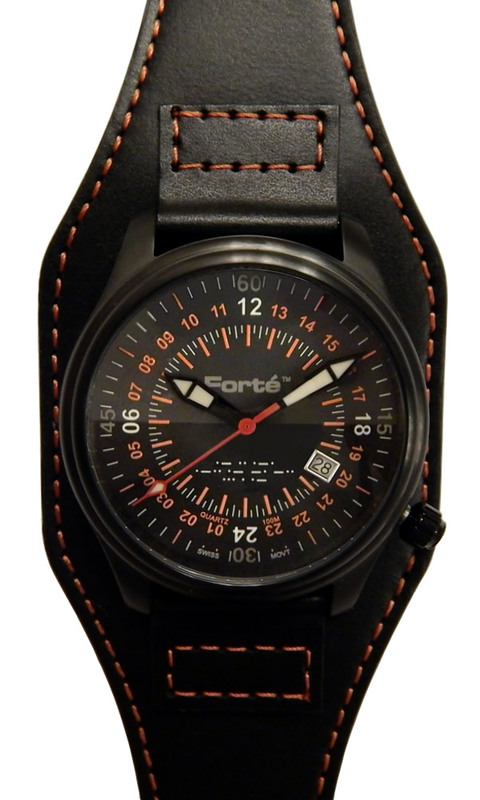 As with our Military Series, these watches include the 3 symbols (Air, Land and Sea) - now as Morse Code on the 24 Hour Dial. Special watch with a 24-hour analog dial has an hour hand that makes one complete revolution, 360°, in a day (24 hours per revolution). Regular watches make 1 rotation around the dial twice a day. With the ALPHA Series we add one more choice to our Military Time: Collector Watches. ALPHA-Series models features: BIG (43 mm) Case (15mm Thick), a Screw-Down Crown at the 4 o'clock (traditional) position that's easy on the wrist, and 10 ATM (300 Feet) Water Resistant. PLUS: Leather Band with matching color stitches; Super LumiNova Hands and Luminous Hour Markers; Domed Mineral Glass (Magnifier), Dial with 2 Shades representing Day and Night. Your choice of 3 different models - One Alpha-Series Model with 00 at TOP! Unique, exclusive and available at VERY reasonable prices. A distinctive and practical 24 hour display. New for 2017: New Dial Layout with Straight Numbers and 10% larger! -- Silicone Strap (4 mm thick) with Orange Stitching! Our new ALPHA Series Watches are our way to say "Thank you" to all of our customers whose comments and suggestions we took to heart in designing this new and exciting Series. We received so many positive statements about our watches and the way we handle our business from a diversity of professions and industries such as... Military, Navy and Army, Special Ops Agents and S.W.A.T. Members, Veterans, Aviation Industry and Pilots, Police, Security and Law Enforcement, Corrections Facilities, Construction and Finance Sector, from Nurses to Healthcare Institutions and Individuals who took their time to provide us with very useful information and insight. A Special Thank goes to Peter Boardman from 24hourtime.info for his helpful input. Why a 24-Hour Dial Watch? because... It's Unique and will be Noticed. Highly valued -- not only among military personal and veterans. 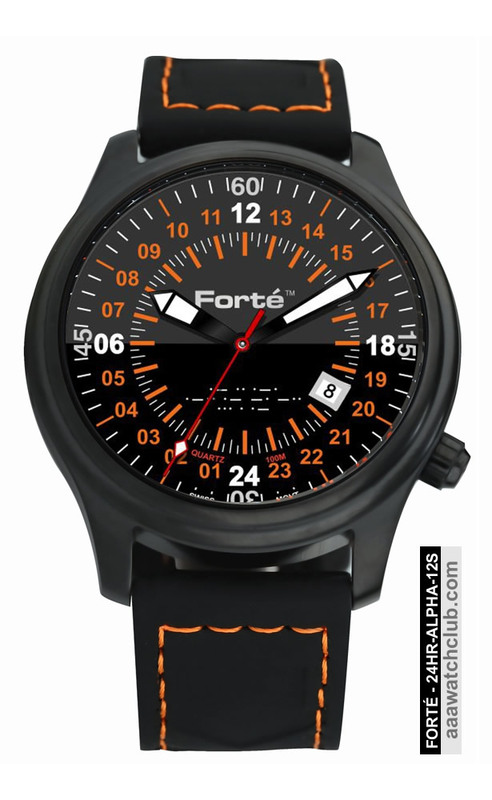 24 Hour Dial - Military Time with 2 Shades (Day/Night) NEW Layout - Straight Numbers! Domed Crystal Domed crystals can be single-domed (curved on top, flat on bottom) or double-domed (top and bottom have parallel curves). A domed crystal is stronger than a flat crystal of comparable thickness because of the arch design. Improved visibilty vs a flat crystal because dome crystals don't concentrate light for reflection (glare effect). In addition an arched form of convex glass with a flat bottom creates a magnification of the watch dial and visually enlarges hour indexes and indices. Many Customers have asked for models with a Bigger Case, to add a Date Function, for a Dial with 00 at TOP or for a Longer Band for larger wrists and an alternative Silicone Strap. We listened... they are now available - 3 Different Models, and with improvements like 10 ATM (300 Feet) Water Resistant, Screw-down Crown at 4 o'clock position and more..